React is another framework in java used to develop single page applications. It is a library to view single applications and is the most popular one. It has been backed by the leading giant Facebook which makes it all the more popular. React library can be used to work with dynamic front-end applications which comprise great features. These features include data binding, component architecture and universal apps. The Zeolearn academy offers the reacts course in New York. The react js training in New York provides you with 24-hour intensive training led by world-class faculties. The trainers are well versed with all the topics required for your proper understanding of the library. You get hands-on sessions which are quite interactive. You learn how the libraries are managed and how Facebook uses it to suffice its purposes. You learn the latest version of React that is React JS also known as React 16. During the react js training in New York, you get to learn to build internet applications using flux, React JS and Redux. You get proper guidance from experts and can approach them anytime after course completion. The reactions course in New York also provides you with mentors who guide you to implement technologies in live projects. 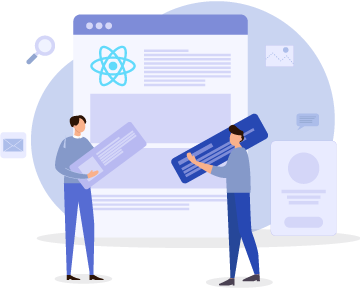 Zeolearn academy also takes up react js online course in New York to provide you with learning facilities in your free time. This is the best way to learn from anywhere and everywhere. From the material to the lectures everything in reacts js online training in New York is similar to that taken up in the classrooms. You need to work upon your systems and should have Google chrome, VS code editor, node >6 and other software installed in your PCs. All these courses are aimed at providing you with the beginner and intermediate level concepts to build SPA applications. React js certification in New York is a very prestigious certification and holds recognition worldwide.